BELIEVER! Collection vol.2| RPG Maker | Create Your Own Game! In volume 2, the guardians are ready for battle! Once every thousand years, a portal opens to a parallel world and strange creatures invade and threaten the Earth. But a group of guardians will rise to protect our daily lives, while tackling battles, romance, love and interpersonal relationships. This is the world of「Believer!」, a beloved visual novel released by D3 Publisher. In volume 2, the guardians are ready for battle! Building up on volume 1 content, volume 2 includes 11 expressions for each of the 5 characters - posed with their formidable weapons. A sky background rounds off this volume, allowing you to create both dreamy and intense scenes. Let the rivalries heat up and the battle commence! Spanning across all 3 volumes, there is a total of over 3800 characters illustrations and 68 backgrounds that are waiting to be used. 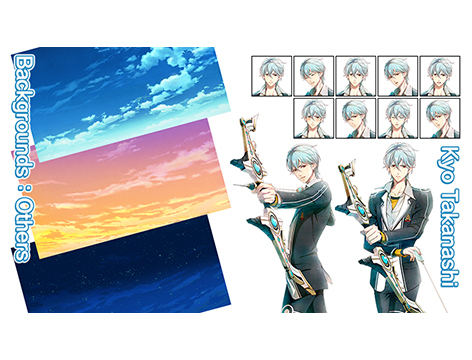 Whether you're looking to craft a novella set in the 「Believer!」 world or simply wish for stylish graphics to illustrate an original love story, you can't go wrong with 「Believer!」 Collection! 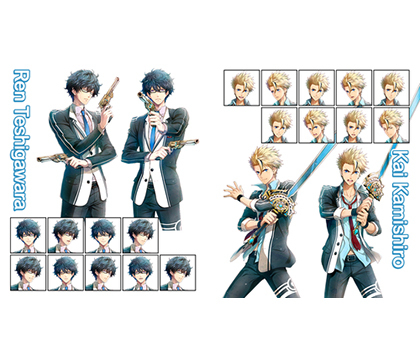 All characters come with 2 poses with weapons, each pose with 11 expressions.